In Washington, the reign of stodgy, stuffy steakhouses is thankfully a thing of the past. There’s never been a better time to opt for something more casual and the burgers on offer in the nation’s capital stack up against the best anywhere in the country. No matter your mood or budget, here are the eight spots to find patty perfection in D.C. This D.C. chain has successfully capitalized on the fast-casual concept by doing as much as possible in-house. Meaning: The ground beef, buns, pickles and even the ice cream in the milkshakes are produced under one roof. The house burger, the “Six Buck Chuck,” proves how satisfying simplicity can be, especially if the ingredients are of top-notch quality. You’ll also want to put their signature “AP sauce,” a savory blend of mayo, ketchup, mustard and chipotle, on everything. Everything. Leave it to chef Michel Richard to add his signature French flair to the classic American burger. His version sears locally sourced, grass-fed beef from the Shenandoah Valley in a cast-iron skillet with salt and pepper to develop a rich, dark crust. He then drapes it with confit tomato, ginger mayo, caramelized onions and a potato tuile, before all getting tucked into a house-baked buttery brioche bun. Not surprisingly, the Red Apron Original burger by celebrated butcher Nate Anda is practically flawless. And the key to the impossibly juicy patty, according to Anda, is using a mix of different aged cuts (like brisket, short rib and sirloin): “Aged fat doesn’t release as much water, so the meat retains its juiciness.” The olive oil brioche bun is put on the plancha for an extra-toasty effect, and the burger is finished with the usual suspects: cheese, lettuce, tomato, onion and sauce. It’s simple and sublime. While the Prez Obama Burger—an umami-packed flavor bomb with bacon, blue cheese, horseradish mayo (apparently no one informed them of Obama’s distaste for mayo) and onion marmalade—might be its claim to fame, Good Stuff Eatery excels in plenty of other good stuff, too. The puffy and crispy Vidalia onion petals play well with any of the burgers, and the best-selling toasted marshmallow milkshake makes for an appropriately sweet ending. This swanky Georgetown spot has an entire menu devoted to burgers, because that’s how much chef Frank Ruta loves them. While all of the original creations are exceptional, it’s the mortadella burger that really steals the spotlight. Just imagine crispy slices of mortadella, gooey truffle cheese and onion jam heaped on top of a massive angus beef patty. Dating back to 1963, Clyde’s is a Georgetown institution. And to this day, the bustling saloon-like restaurant is the kind of joint where college kids (mostly with their families) and politicians feel equally comfortable with the long menu of American comfort food, including the cheeseburger. Free of frills and fuss, it’s perfectly grilled beef, lettuce, tomato and cheese between a sesame seed bun. 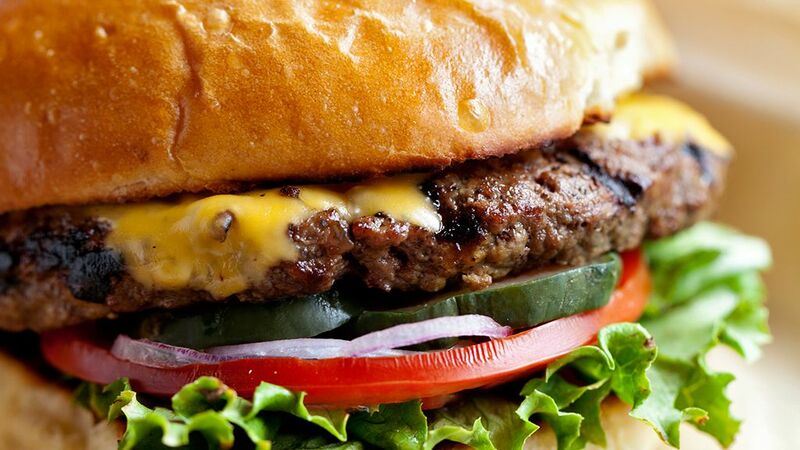 It’s everything a classic cheeseburger should be: no more, no less. Before you balk at the price, take a closer look at the meat. The hefty eight-ounce patty in the $19 Oak-fired Prime Steak Burger stars 50-day dry-aged New York strip steak. Top it with house-made sour pickles, sauce and aged Cabot cheddar, and you’ve got all the makings for a perfectly upscale, delicious burger. For $3 more during lunch, you can also score a side (hello, duck-fat fries with dipping sauces), drink and ice cream sandwich. Why eat eggs for brunch, when you can have a truly decadent burger instead? That’s the thinking at this adorable bistro, where slabs of brie and bacon, onion jam and a sunny-side-up egg crown a thick, juicy patty. It’s just the thing to take the edge off of last night’s excess and reset you for more, if you wish. Related: Best Live Music Venues in Washington D.C.